Few landscapes in Europe match the unique beauty of the Dolomites, part of the UNESCO world heritage list since 2009. This beautiful tour offers you mountain scenery, green landscapes and gently flowing rivers. 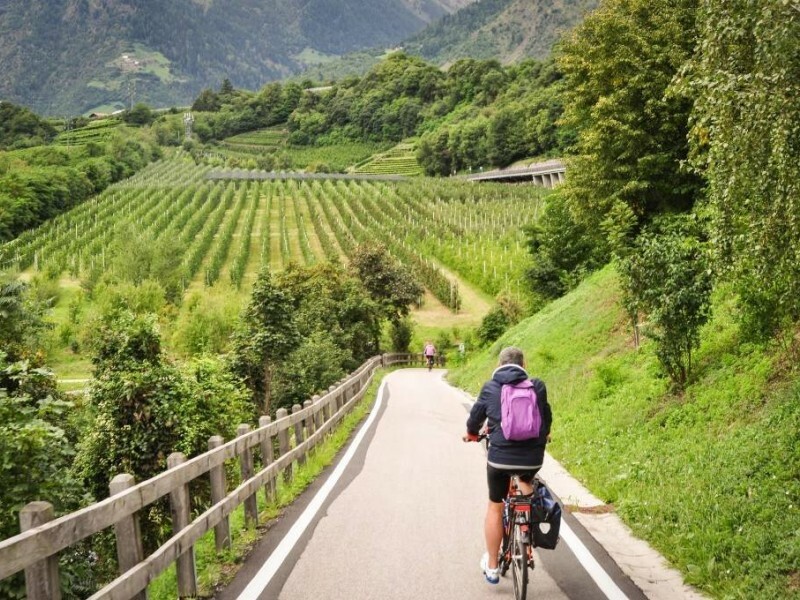 From the Austrian border through the Italian South Tyrol you will cycle along quiet and beautiful routes, past peaceful villages and picturesque little castles and cloisters. The highlight of the tour is a boat excursion on the Lake Garda, where you will enjoy this impressive expanse of water from a really unique perspective. At the end of the tour you’ll reach the fascinating Verona, the town of Romeo & Juliet, with its imposing Roman arena. This tour is also suitable for children. 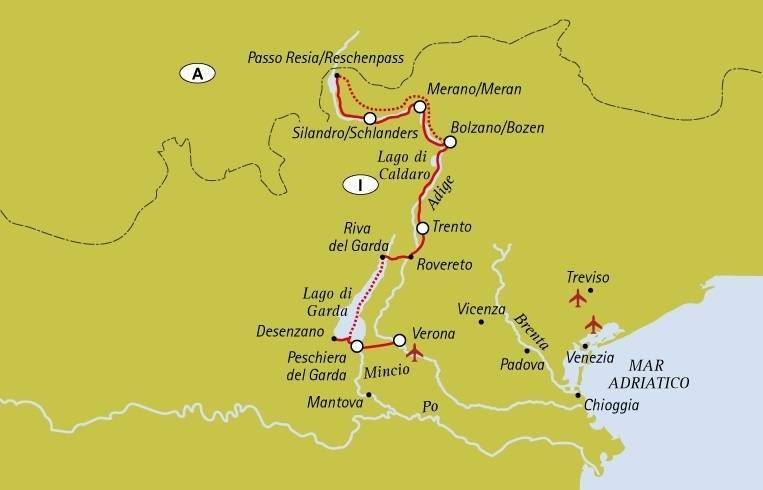 The longest stage, from Bolzano to Trento, can be shortened by taking the train. Individual arrival. 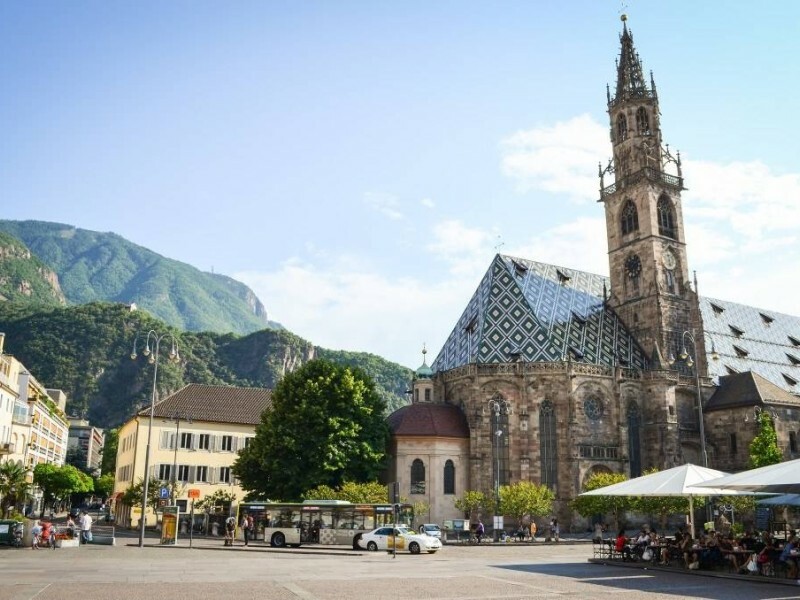 Bolzano is a famous commercial and tourist centre and also a historical and cultural connection between the Italian and the German world. We will drive you to Resia up to 1500 metres of height, where your cycling tour starts. 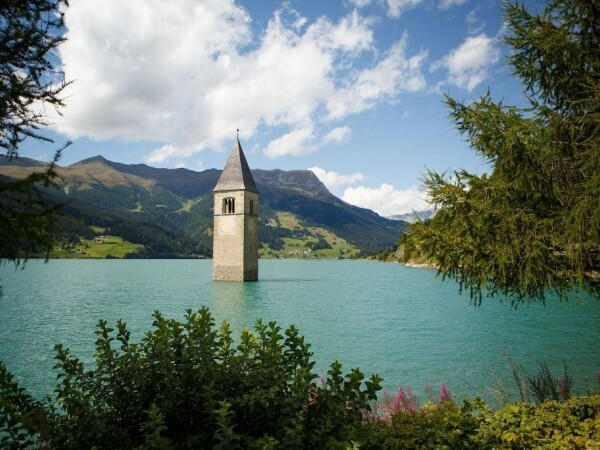 The majestic cycle lane will take you past the lake Resia and the cloister of Montemaria near Silandro. 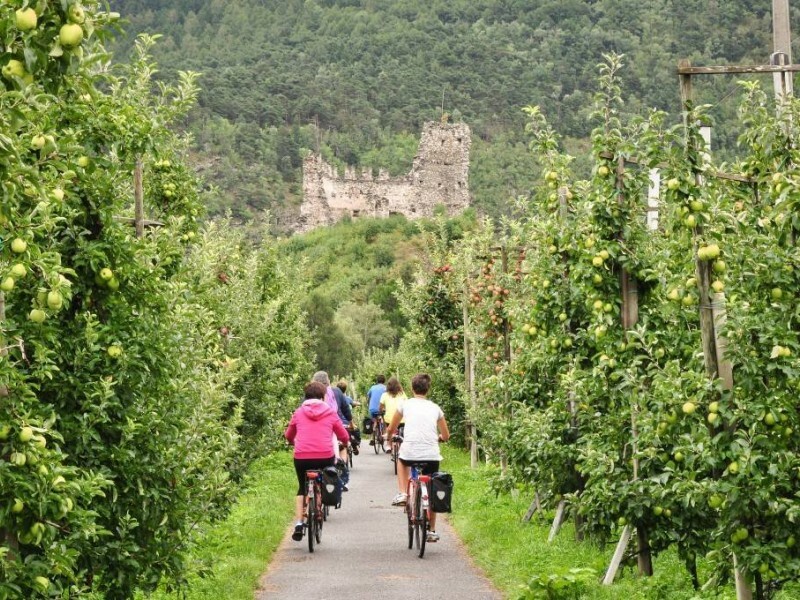 The tour continues along the river Adige, passing through orchards and nice landmarks like the imposing Castle Dornsberg. You arrive in the beautiful city of Merano. Cycling on cycle paths and secondary roads you will reach the confluence of the rivers Isarco and Adige. Along the way you will admire the biggest apple plantation in Europe and in Lana you can even visit the apple museum. 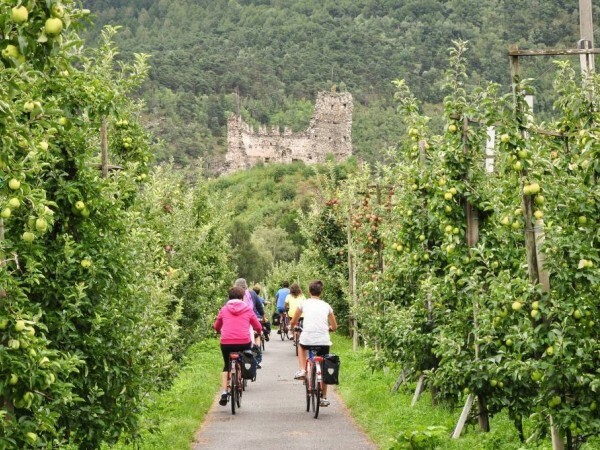 Cycling along the lane you follow the river Adige beside apple orchards, vineyards and through the villages of Ora, Egna and Salorno. Along the river banks you ride towards Trento. Possibility to shorten the stage by taking the train in several train stations along the way. You’ll reach the northern part of Lake Garda. Before leaving for Riva, don’t miss the sight of the lake from above! The ferry cruise takes you to the southern part of the lake. The boat excursion alone makes the whole trip worthwhile. Today you head to Verona, one of the most important and beautiful cities of Italy. Mainly along flat roads with only a few rolling parts. The region of South Tyrol is provided with an excellently built cycle lanes system. You can ride almost exclusively on well planned, traffic free cycle lanes, part of which run along the Adige river banks. Towards Lake Garda there are a few more challenging hills to face. Day 2: Resiapass-Silandro (50 km, vertical up 120 m) Easy itinerary mainly on paved cycling paths and secondary roads. There are some stretches of dirt roads in good condition. Transfer: about 150 minutes by private transfer from Bolzano to Resiapass. 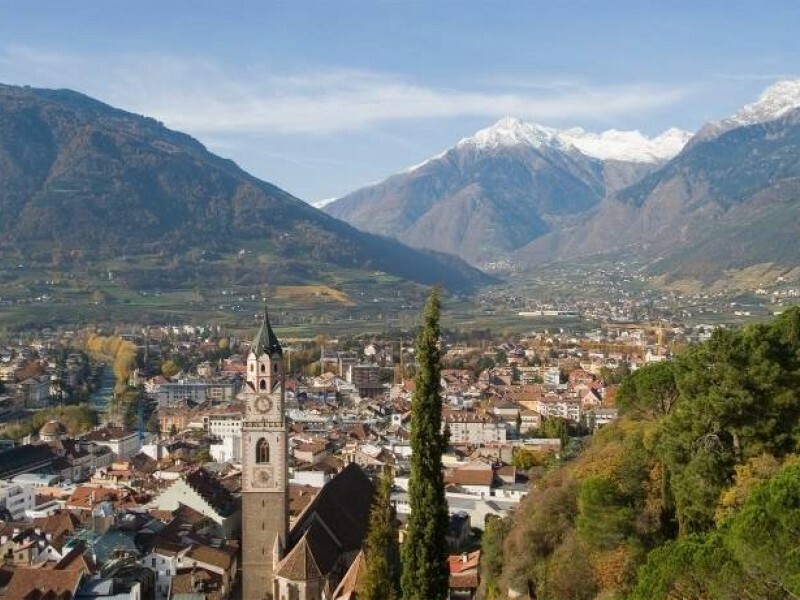 Day 3: Silandro-Merano (40 km, vertical up 60 m) When you leave Silandro, the cycling route follows the Adige river along country roads. Easy route mainly on paved cycling lanes and secondary roads. Day 4: Merano – Bolzano/surrounding (35/40 km, vertical up 60 m) The so called Ciclabile delle Mele (apple cycling path) continues along the Adige river which runs parallel to the railway line Bolzano-Merano. Easy itinerary mainly on paved cycling paths and secondary roads. 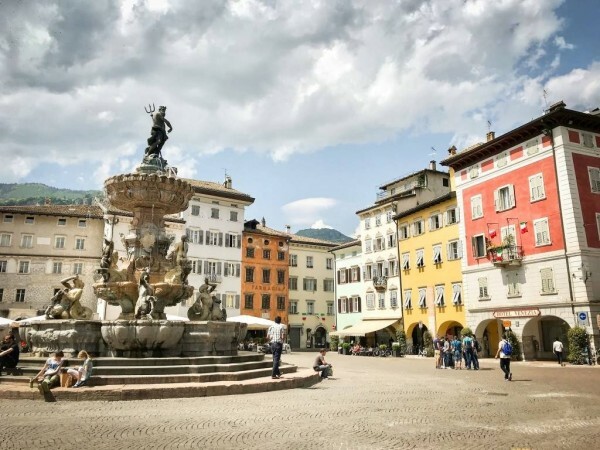 DAY 6: TRENTO-DESENZANO/PESCHIERA (50 KM, VERTICAL UP 140 M) The only difficulties are some short slopes uphill before reaching Riva del Garda where you catch the ferry. Navigation: about 4-5 hours by ferry from Riva del Garda to Peschiera or Desenzano. We recommend flying to Verona, Innsbruck or Venice region airports to reach the starting point of this cycling holiday. The Dolomites and Lake Garda cycling holiday includes the daily transfer of luggage to the next hotel and local support if required. Tough, stable and reliable, specially designed for you to saddle up for several days on the trot. 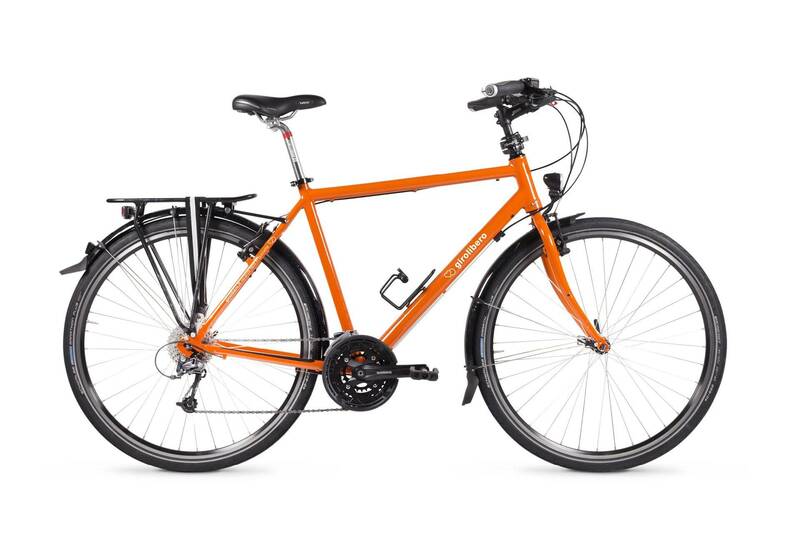 Girolibero bikes are citybikes with an aluminium frame and kitted with responsive brakes and gears. Plus: mudguards, trip computers, comfort gel saddles, flat-palmed grips, Schwalbe Marathon anti-puncture tyres. A low entry unisex frame, ideal for an upright but relaxed riding position. The number of gears varies by destination. In Italy, for instance, standard bikes have 27 gears, while in northern Europe they are generally fitted with 7 gears and a pedal brake (although bikes with more gears and conventional breaks can sometimes be requested). 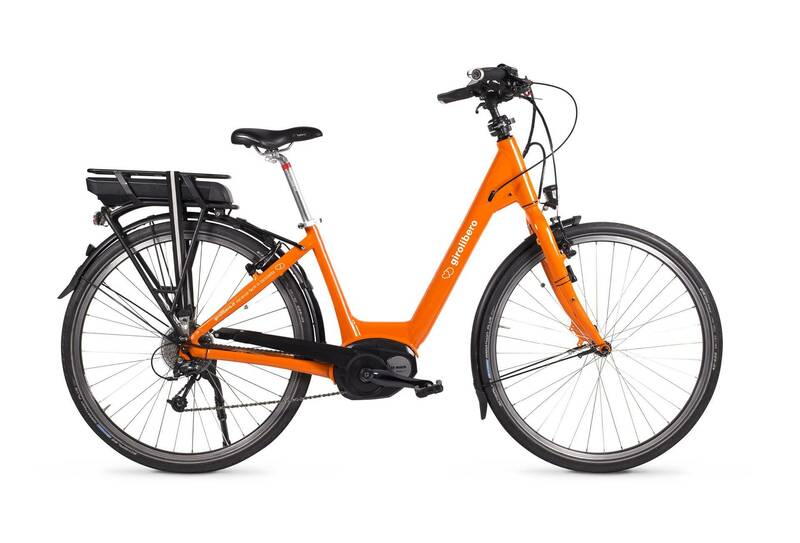 Citybike with men's frame. The design and number of gears varies from country to country. As with unisex bikes, for example, bikes for our Italian tours have 21/24 gears, while in northern Europe they are usually fitted with 7 gears and a pedal brake (although bikes with more gears and conventional breaks can sometimes be requested). 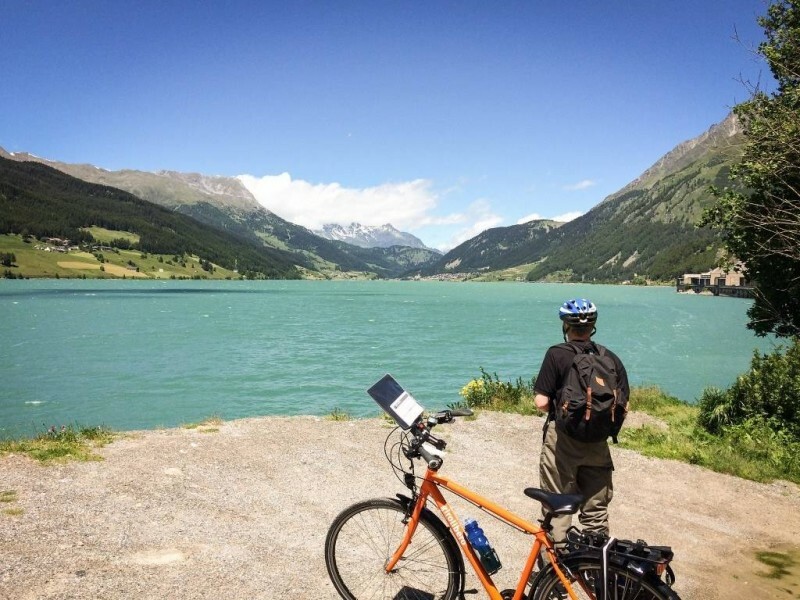 E-Bike upgrade prices vary per tour, but if you require any more information about bike hire and electric bikes, please get in-touch with us on +44 (0) 800 755 5385. Bosch batteries Power Packs of top safety and long life (36 V - 13,4 Ah Capacity - 500 Wh available power). Bosch motor Active Line, located centrally (250 Watt, engine torque 50 Nm). Range: approx 90 km (flat terrain, average speed). When you make a booking with us, we take your height(s) and the appropriate bike size is matched up accordingly. Helmets are not provided and you will need to bring your own to use. We always recommend wearing a helmet when on your cycling holiday.